Central Library Manchester has closed ahead of the opening of Tūranga on Friday 12 October. Central Library Peterborough remains open until 5pm, Sunday 26 August. All holds normally picked up from Central Library Manchester are being sent to South Library. Items borrowed from Central Library Manchester may be returned to any Christchurch City Libraries branch. Is it for you? Yes, if you like brutal, in-depth character studies, dark humour, or existential novels. Jósef Loewe can recall the moment of his birth in August, 1962 and everything that has happened since; or so he claims to the woman listening to the tale of his life. He begins with his father, Leo, a starving Jewish fugitive in World War II Germany. In a small-town guesthouse, Leo discovers a kindred spirit in the maid who nurses him back to health; together they shape a piece of clay into a baby. Leo escapes to Iceland with the clay boy inside a hatbox, only to become embroiled in a murder mystery. It is not until 1962 that his son Jósef can be born. In modern-day Reykjavík, a middle-aged Jósef attracts the interest of a rapacious geneticist. Now, what lies behind Jósef's tale emerges. And as the story of genesis comes full circle, we glimpse the dangerous path ahead for humankind. In this epic novel, Sjón has woven ancient and modern material into a singular masterpiece encompassing genre fiction, history, theology, folklore, expressionist film, poetry, comic strips, myth, drama and, of course, the rich tradition of Icelandic storytelling. Harry Tabor is about to receive the Man of the Decade award. As he enters his twilight years, this distinction seems like the culmination to a life well lived. A perfect life. A life spent helping Jewish refugees from all over the globe find a better life in America, giving them a second chance. Harry knows all about second chances. He has the perfect marriage; his wife, Roma, is an eminent child psychologist, and they tell each other almost everything. His three grown children, Phoebe, Camille, and Simon, are all accomplished. But his life could have very well taken a different turn if, seemingly a lifetime ago, he hadn’t uprooted everyone from their life in Connecticut and brought them out to the desert, literally, where they knew no one and he could start again. In The Family Tabor, Cherise Wolas examines the five members of the Tabor family as they prepare to celebrate Harry. Through each of their points of view, we see family members whose lives are built on lies, both to themselves and to others, and how these all come crashing down during a seventy-two-hour period. In the summer of 1951, Miranda Schuyler arrives on elite, secretive Winthrop Island as a schoolgirl from the margins of high society, still reeling from the loss of her father in the Second World War. When her beautiful mother marries Hugh Fisher, whose summer house on Winthrop overlooks the famous lighthouse, Miranda’s catapulted into a heady new world of pedigrees and cocktails, status and swimming pools. Isobel Fisher, Miranda’s new stepsister; all long legs and world-weary bravado, engaged to a wealthy Island scion, is eager to draw Miranda into the arcane customs of Winthrop society. But beneath the island’s patrician surface, there are really two clans: the summer families with their steadfast ways and quiet obsessions, and the working class of Portuguese fishermen and domestic workers who earn their living on the water and in the laundries of the summer houses. Uneasy among Isobel’s privileged friends, Miranda finds herself drawn to Joseph Vargas, whose father keeps the lighthouse with his mysterious wife. In summer, Joseph helps his father in the lobster boats, but in the autumn he returns to Brown University, where he’s determined to make something of himself. Since childhood, Joseph’s enjoyed an intense, complex friendship with Isobel Fisher, and as the summer winds to its end, Miranda’s caught in a catastrophe that will shatter Winthrop’s hard-won tranquility. A tough, thoughtful, and savvy opportunist, Gael is determined to live life on her own terms. Raised in Dublin by single-minded, careerist parents, Gael learns early how a person's ambitions and ideals can be compromised, and she refuses to let her vulnerable, unwell younger brother, Guthrie, suffer such sacrifices. When Gael's financier father walks out on them during the economic crash of 2008, her family fractures. Her mother, a once-formidable orchestral conductor, becomes a shadow. And a fateful incident prevents Guthrie from finishing high school. Determined not to let her loved-ones fall victim to circumstance, Gael leaves Dublin for the coke-dusted social clubs of London and Manhattan's gallery scene, always working an angle, but beginning to become a stranger to those who love her. Written in electric, heart-stopping prose, Orchid & the Wasp is a novel about gigantic ambitions and hard-won truths, chewing through sexuality, class, and politics, and crackling with joyful, anarchic fury. It challenges bootstraps morality with questions of what we owe one another and what we earn. 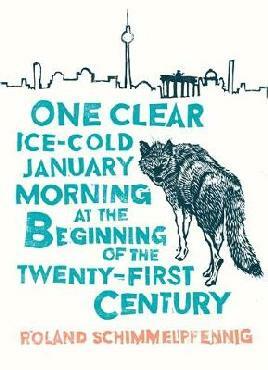 One clear, ice-cold January morning shortly after dawn, a wolf crosses the border between Poland and Germany. His trail leads all the way to Berlin, connecting the lives of disparate individuals whose paths intersect and diverge. On an icy motorway eighty kilometres outside the city, a fuel tanker jack-knifes and explodes. The lone wolf is glimpsed on the hard shoulder and photographed by Tomasz, a Polish construction worker who cannot survive in Germany without his girlfriend. Elisabeth and Micha run away through the snow from their home village, crossing the wolf's tracks on their way to the city. A woman burns her mother's diaries on a Berlin balcony. And Elisabeth's father, a famous sculptor, observes the vast skeleton of a whale in his studio and asks: What am I doing here? And why? Experiences and encounters flicker past with a raw, visual power, like frames in a black and white film. Those who catch sight of the wolf see their own lives reflected, and find themselves searching for a different path in a cold time. The world is shrouded in snow. Transport has ground to a halt. Tom must venture out into a transformed and treacherous landscape to collect his son, sick and stranded in student lodgings. But on this solitary drive from Belfast to Sunderland, Tom will be drawn into another journey, one without map or guide, and is forced to chart pathways of family history haunted by memory and clouded in regret. 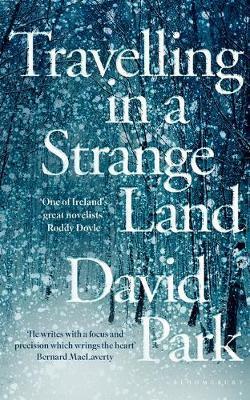 Written in spare, crystalline prose by one of the most important voices in contemporary Irish writing, Travelling in a Strange Land is a work of exquisite loss and transformative grace. It is a novel about fathers and sons, grief, memory, family and love; about the gulfs that lie between us and those we love, and the wrong turns that we take on our way to find them. Christmas morning, 1969. Eleven year old Esme Lonsdale is opening her stocking. Its contents are thoughtless and wrapped in a bizarre concoction of birthday paper and wet towels, yet Esme is filled with wonder that Father Christmas could have been so ingenious. In reality, Father Christmas is Diana, Esme's mother, a woman wracked with manic depression, an embarrassing ailment to which her husband, Colin, turns a blind eye. So when Diana goes missing in the snow, only Esme and a close family friend, the Duke of Cluny, are worried. But Diana is soon found in the stables, happily drunk and rescued from the blizzard by Jimmy, the irreverent stableboy. By Boxing Day morning, life changes forever for little Esme, when Colin discovers his wife in a passionate embrace with the Duke. And as the family are dragged home in a mess of tears and rage, it's clear that the affair is only the first skeleton to come tumbling out of the closet. A vision appears in the sky above wintry New York and seems to exert an influence over two brothers, in this luminous, compassionate novel from the author of 'The Hours'. Barrett Meeks, having lost love yet again, is walking through Central Park when he is inspired to look up; in the sky he sees a pale, translucent light that seems to regard him in a distinctly godlike way. Barrett doesn't believe in visions-or in God-but he can't deny what he's seen. At the same time, in nearby Brooklyn, Tyler, Barrett's older brother, a struggling musician, is trying to write a song for Beth, his wife-to-be, who is seriously ill. Tyler is determined to write a wedding song that will not be merely a sentimental ballad but an enduring expression of love. Barrett, haunted by the light, turns unexpectedly to religion, while Tyler grows increasingly convinced that only drugs can release his creative powers. Cunningham follows the Meeks brothers as each travels down a different path in his search for transcendence. In subtle, lucid prose, he demonstrates a profound empathy for his conflicted characters and a singular understanding of the human soul.